Considering this 7001's innovative features, other scales don't match up! Programmable Auto-Off Feature If you've ever had your scale turn off on ya in the middle of important measurements, you'll realize what a blessing this feature is. You can program the 7001DX to turn off automatically, or to stay on until you turn it off yourself. It Remembers The Last Unit Ya Used If your application needs weights in the same unit of measurement, (like ounces for instance), it can be a real pain if your scale always turns on ready to weigh in grams. It's a good thing the 7001-DX turns on displaying the unit of measurement you were using when ya turned it off. Useful Attachments The 7001DX is super versatile. 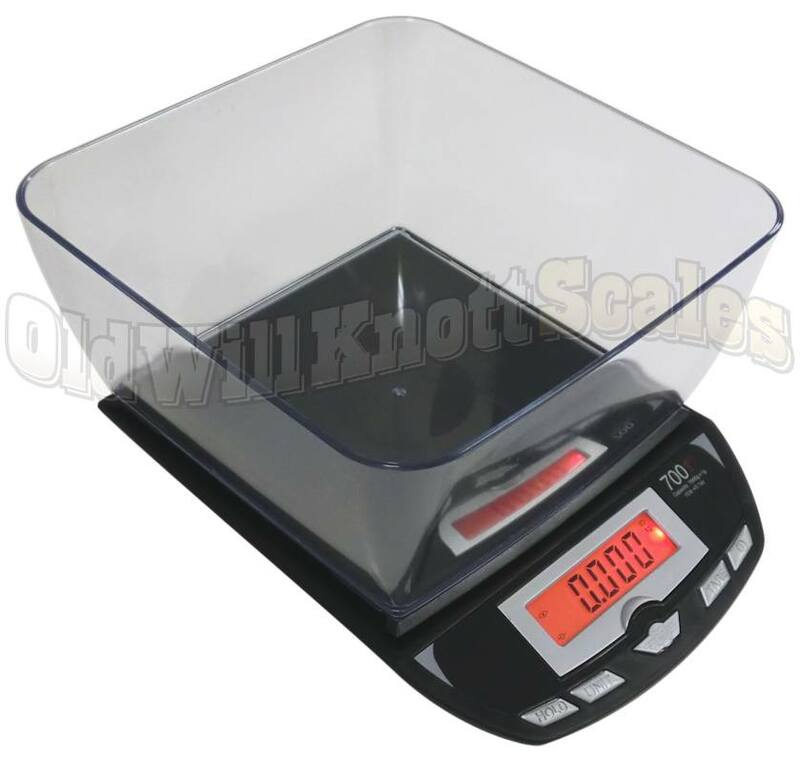 Use it with the included weighing bowl to turn it into a kitchen scale, stick the shipping tube or letter holder on to use the 7001 as a nice postal or shipping scale, or weigh your items directly on the platform. The weighing bowl holds 2.0 liters, and measures 7.25 inches wide at the opening and 5.6 inches wide at the base, with a height of 3.4 inches. The 7001DX is your answer for multi-purpose weighing. Love my new scale so do my rabbits. The bowl holds them perfectly. I also like the memory capabilities. Manual says in order to enter advanced settings mode press center and power buttons simultaneously for 3 sec. But they don't tell you the unit must be off first, then press and hold center button, press and release pwr button, release center button after 3 seconds. After unit finishes startup countdown it will be in advanced settings mode. Very pleased with the product and ease of us. Also pleased with the options of kg, pound/oz or pound or oz. easy to read screen. Can also weigh packages or letters for proper mailing. Also great for cooking. The tare option is great when weighing combined products. Really like these scales. I highly recommend these if you are looking for accurate and ease of use with options. this scale was recommended to me by my son. I use it to weigh puppies from birth and up. I am very pleased with this scale and the multi functions that it has. This is the second one of these I've purchased in the last 8 months. I am a raw-feeder for my dogs, as well as a breeder, and dog trainer; so needed this scale at work AND at home. It gets used every day - whether I'm weighing food portions, or puppies. :) And occasionally even mail! I love that it can calculate in percentage of pounds, as well as pounds/ounces, and kgs! Absolutely great scale. I like being able to change the units from grams to ounces. I weigh mostly food and dog food. It works great! After a few years it will stop working but they will fix it for free. 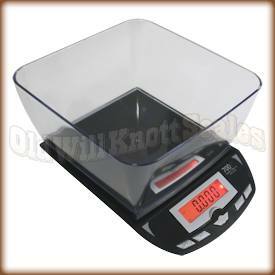 I have bought several of these scales and keep them with a new litter. They work great for a couple of years then stop working, but Old Will Knott will replace them if this happens. For me it is an excellent way to weigh kittens up to six weeks old. This is a handy, easy to read scale for small animals.....kittens, hamsters, small puppies, etc. Simple to use. fall out of the scale. delivery. Everything was just great. I found the scale on various other sites for twice as much in cost as well as the attachments and cord was considered add-ons. When I received it everything was packaged very well worth absolute no damage to the packaging. Once I opened the box and read over the instructions I discovered that it's best to calibrate the scale using a 5kg weight. Since I didn't see this in the description before buying I didn't have one on hand so I made one myself to use. Calibration was very simple. I love the fact that there is multiple weight measurements so I am able to pick which one is better for my individual needs. Perfect for my needs I am glad I chose this scale. It's so precise and the bowl makes it so much more perfect. I carefully selected this scale for my needs weighing spice for weighing meat & spice blends. I specifically needed features on the scale of 3 decimal readout which this scale has. It works very well and I am very pleased with it and the "Old Will" Company. They are running their business in a very good fashion with great selection of products through how they correspond with you as a customer which is very positive. I use it to weigh my snakes and rats. I tested the scale for accuracy first with a weight tester and it was on point. Easy to read and fast due to reptiles and rodents are not always cooperative. Great for at-home Body care formulation! I purchased this to use in starting my own small business and for the price, it's provides close enough accuracy when making a decent size batch of custom homemade bodycare. I love the fact that it measures in a variety of units and the clear measuring bin that comes with it. This scale does so much. I originally bought it for weighing fiber for spinning, but now will also be using it for soap making. Although the bowl is too small for the carded fiber I need to accurately weigh, I used my largest stainless steel mixing bowl and quickly made the proper bundles for spinning. The tare function is great and helped me a lot even down to half an ounce in my great big bowl. I am very pleased with this scale and the service I have received from this company. I have been using this product for over 5 years. Just recently one of my scales stopped working so I ordered another. During this process I was informed that the scale at this location was still under Warranty. I was sent a copy of the Warranty and a copy of the sales receipt to be able to send in for repair or replacement. Since I have multiple stores I sent in and just received it back. Now I have a back up in the event I have a problem in the future. Awesome Customer Service...... Thank you! I bought this scale in 2003, expecting the normal 1 year life that every other scale I've ever used had. I used it professionally ( in a bakery and restaurant) for 4 years, until I retired and I'm still using it & recommending it to the students I teach. It remains accurate down to 1/10th of an ounce and 1 gram. I bought the adaptor and I think it helps keep the scale going. I never use it without the adaptor plugged in. I hope they never discontinue this one! Extremely satisfied with purchase of the 7001DX digital scale. Received my order promptly & have been using it every day. I last purchased a scale over 20 yrs ago for soap making. When I was researching one to replace it I decided upon this one. The price was 1/4 of what I originally paid and the functionality is far superior. This is a great multi-purpose scale for mail, the kitchen, etc. The fact that it weighs up to 15lbs 7 oz is just awesome!! I was a bit hesitant when I placed my order as I could not believe the price would provide a quality product. I was wrong. This is a wonderful, affordable product. I am a macaw breeder. Every baby MUST be weighed every day. It is the ONLY way to be sure a baby bird is healthy and gaining weight daily. This scale delivers! Simplicity of use, tare function and the ability to 'hold' weights for an sum total is invaluable! My babies are about to outgrow the provided container but with the tare function I can replace it with a larger stable vessel with no worries. Backlighting the display was genius since I don't want to wake up all babies at once or the entire household. Many more features as well make this THE scale for a bird breeder like myself! The only change should be to provide a suction mount perch to weigh the birds when they learn to perch. I HIGHLY recommend this scale to any and all folks in any animal business where daily weight gain/loss must be accurate and easy to check. You can't go wrong with the 7001DX. This is an excellent product. Easy to use and priced well. The item was shipped promptly and I didn't even need to read the directions to put it right to use. Everything is perfect! I love my scale. This scale works great. I use it to weigh plaster of Paris in the dry powder state. I like the back light on the startup. You can tell when it is ready to go without having to watch the numbers. I really like the scale. it had all the function I needed, and is easy to use. After purchasing two scales from other vendors which were cheaply made and died within months, I've finally found a high quality, reliable, well-made scale. I love that I can use the adapter if I run out of batteries as well. However, batteries seem to last forever in this model (7001 DX)! I highly recommend this scale to anyone who needs a really good kitchen scale. There are none better. Love it! The 7001DX is a very nice scale. The backlit display is a nice feature, as is the ability to tilt the display window. The compact size is great for storage. The bowl is large and securely sits upon the scale or can be removed if not needed. My scale is used to weight small items and is so much better than the old one I had that only read in .5 ounce units. I am very happy with the purchase of this scale. The order was filled, shipped, and delivered very quickly. Well packaged and arrived in excellent condition. I would certainly do business with this website in the future should I need to replace this scale or purchase a different one. My Weight 7001DX and diet. Got this to weigh food to watch weight. Am very happy with how easy it is to use. We are developing sauces & dressing for local farmer's markets and needed to accurately measure ingredients. The 7001 does the job great. Easy to use, clear readout and well worth the money. Thanks for a great product. I bought this to weigh my pet rats. The included plastic tub fits snugly to the top of the scale without sliding around and it provides a perfect place to set a rat. Sometimes they'll even stay there for a minute! But the scale is quick enough to get a good reading on their weight. I was able to use the scale right away without even reading the instructions, I'm going to do that now to see what I may have missed! Great scale! I use it to measure my snakes; it's very accurate and easy to use! Great little scale. I use it for my soap and lotion business. Measures acurrately. Lots of add ons included, great for the price! So far I'm loving my new scale, this was the only good brand I could find with the color I wanted. It reads accurately (tested it with a variety of objects for the fun of it) and the tub it comes with had been a great help. That and the hold button makes weighing my young reptiles much easier. This has been a great item for both measuring light items like lavender for sachets and for soap making. I even love it for weight mail. Best pricing and best products. I really wanted this scale and searched throughout various websites. This site actually had the lowest price for his scale. The scale itself is scary accurate, and works like a charm. I couldn't be happier with my purchase. I use it to accurately measure the weekly growth of my exotic reptile. You won't be disappointed with this scale, trust me; I don't write reviews for nothing. Have now used this scale about 7 times with no problems for soaping. This was recommended by other soaping friends and was a great buy! Will use this forever and highly recommend it to others! WOW! You guys are the bomb!!! Great products! This is my second scale and I love it!!!!!!!!!!!!!!!!!! I purchased these scales for weighing my chemicals for making cr?mes and lotions. I love multiple units of measurements and a weighing bowl that can be de-attach if I do not need it. And the price is very reasonable; eventually, I will buy more expensive and precise balances; but for now these scales will do just fine! Once I finally figured out the scale (you wouldn't think it would be so hard!) and how it works, I loved it! After a lot of frustration and swearing, I realized that I was weighing everything in oz and not in lbs. You can choose what unit of measurement! I LOVE this scale! We bought two of these for our little cafe. One is hooked up to the AC power and the other is running on batteries. They are great! They are super fast, I put the container on and press tare and it goes to zero immediately. I pour my beans and the grams count up as I pour. No more waiting! Love the feature that allows me to change the ounces to grams ..... Etc. exactly what I needed to use with myfitness pal. This scale is very accurate and dependable. I use it to properly weight my model train freight cars. The only complaint is is drains batteries even when off. You have to replace batteries about every 4 or 5 months whether you use it or not. But it's no big deal. Hi, How well does this scale perform when it is not on a level surface (I want to use it in a field research setting). Thanks. The My Weigh 7001DX is a good scale, but it may not be the best choice if you plan on using it on an unlevel surface. Most scales need to be on a flat, level surface if you want to make sure the readings are accurate. Depending on what you're weighing, you may want to try a hanging scale, or a scale with a weigh-below hook.